Moira Lo Bianco is a classically trained artist that brings a rich cultural and musical background to her pianism. Her language covers a wide range of styles and influences, from classical to jazz to the folk traditions of her native Calabria. A Young Steinway Artist, Moira aspires to re-introduce the art of improvisation into classical music through her workshops and performances, and to help the next generation of listeners understand and appreciate the influence the classical tradition has had on the musical styles that followed. The idea of improvisation in the tradition of classical music has existed since the distant past. It's almost certain that it's been practiced since the start of Gregorian sacred music. In Gregorian chant, the melody (vox principalis) was superimposed with a second voice (vox organalis), which was usually improvised. This was a free form vocal accompaniment that was sung in different intervals with the vox principalis. 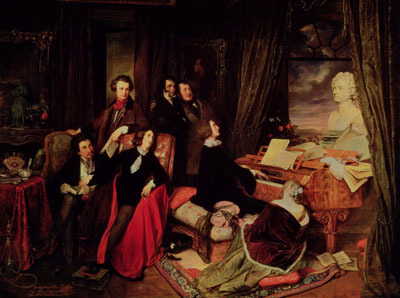 Later, many forms of classical music were based on improvisation, like preludes, fantasies, and fugues. Also, many great harpsichord and organ composers from the 16th through the 18th centuries were masters of improvisation, such as Giovanni Gabrieli, Girolamo Frescobaldi and Johann Sebastian Bach. Improvisation competitions became very common for example between Wolfgang Amadeus Mozart and Muzio Clementi, or between Domenico Scarlatti and Georg Friedrich Handel. As a young pianist in Vienna, Ludwig van Beethoven also participated in special evenings for duels on improvisation. Later on (in the 19th century), composers would leave room for improvisation in their scores by introducing a well-spaced melodic cadenza, that would give the soloists the chance to show off their unique personality. Most recently (the second half of the 20th century), composers like Cowell, Stockhausen and the movement known as ‘Aleatoric Music’ have approached improvisation in many different ways, by composing pieces that often granted the space for musicians to improvise. As a classically trained pianist, I want to share the idea that improvisation dates back centuries and belongs to the classical tradition. My intention is for students to understand that the music they are studying is a product of historical and social influences. Understanding how culture, society, and history impact music will help students find inspiration in their own worlds for their compositions and improvisations. When a musician approaches a genre, be it classical, jazz, pop, funk, etc., either as a performer, composer or improviser, generally he/she aims to imitate or emulate. The aim for many –particularly students learning the basics– is to conform to the sounds of that specific style. Instead, my goal is to use classical music as a tool that allows students to develop unique identities as musicians. I aspire to offer students this genre as a source of inspiration that is useful, exciting and enriching outside of the traditional classical context. So my goal is for students to revisit the classical repertoire, and to re-invent it, in a way. Important aspects of my teaching include ear training exercises useful for analyzing compositions, creating progressions and voicing on the piano, and developing piano solo techniques. I also introduce them to some improvisation techniques like paraphrasing, creating original melodies and free form improvisation. I want to give students the necessary tools to create their own improvisations, arrangements and eventually original compositions that can freely reinvent a classical composition or classical elements. Starting from the 16th century, the European Salons were the most important places for the exchange of ideas, with inspiring hosts who would bring together interesting guests and performers for a truly enlightening evening of music, literature, and discussion. I come from Italy where the salon culture was fundamental in the Renaissance period thanks to the Italian aristocratic families in Milano (Sforza family), Mantova (Gonzaga family), Ferrara (Este family), Urbino (Montefeltro and Della Rovere family), Firenze (Medici family), among others. This relationship between the aristocracy and the creative artists and thinkers of the day was instrumental in defining the rich and vibrant culture that blossomed around them, as well as during the later Enlightenment and Romantic periods all across Europe, and particularly in Paris.